Today, the actual medical group, the American Academy of Pediatrics (AAP) released several pieces of evidence-based guidance to support the care and protection of transgender youth. This included a detailed press release, user-friendly info kit, and a citable evidence-based review of the best practices for trans care for youth. 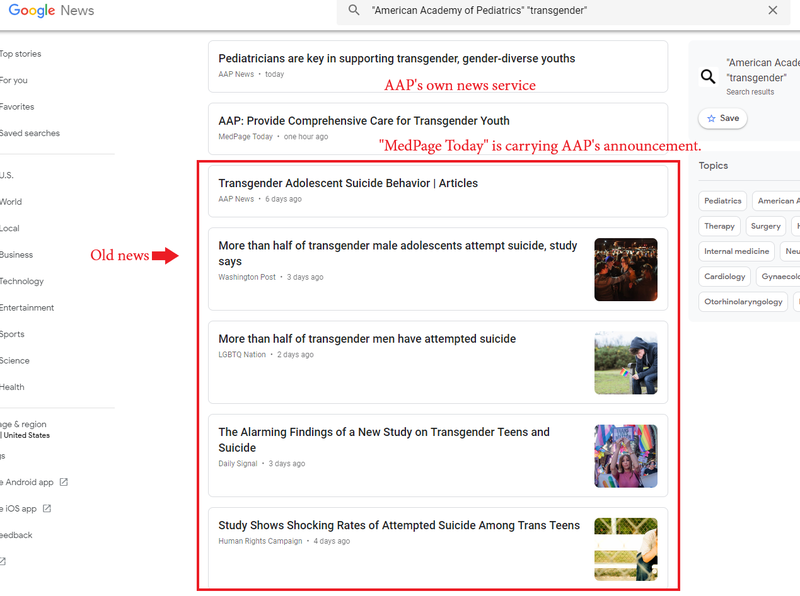 A google news search returns one website that’s covering AAP’s important news while dozens of sites covered a fake medical group’s anti-trans propaganda1. In fact, the fake AAP organization, the American College of Pediatrics(ACP), is a hate group that enjoys televised appearances when it issues a press release about transgender youth, and yet, those who support anti-trans ideology continue to wrap themselves into paroxysms of ever-higher levels of hysteria concerning their supposed lack of free speech and media bias (especially concerning the fake diagnosis of ROGD). Even so, what AAP released today is invaluable to those who care about actual science and the wellbeing of trans and gender-diverse children.